Although “only” three Israelis have been killed as a result of the ongoing Hamas terror rocket attacks against Israel, hundreds of thousands of people are suffering – perhaps none more than residents of immigrant absorption centers in southern Israel. 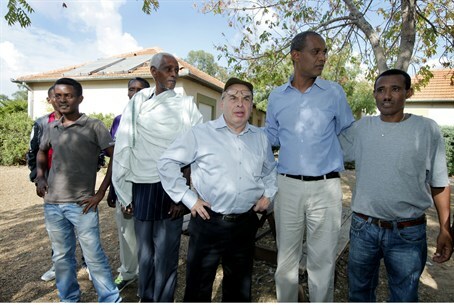 Unlike veteran Israeli families, these new immigrants – many of them olim from Ethiopia – have no family elsewhere in the country to take them in, and hence nowhere to go. Some 450 Ethiopian immigrants, most of them in the country only a few weeks, live at the center. The immigrants are the latest ones to arrive in Israel as part of project “Wings of Doves,” dedicated to bringing the last Jews of Ethiopia home to Israel. About 100 of the immigrants arrived in Israel the weekend before Operation Pillar of Defense began. An Agency spokesperson said that all the housing units in the Ivim center had their own “safe room” for residents to use in the event of a rocket attack. The spokesperson said that immigrants had undergone thorough training on how to react in the event of an attack, and that doctors and social workers were on hand to help the immigrants deal with the experience.